0.4 We were on our way to Peter Luger Steakhouse. 0.5.1 There was a bustle, almost a dance that the wait staff was doing. 1 Famous Ice Cream Sundae! We purchased our One-Way tickets this week to our first stop on our Around the World Trip, Hong Kong, and it dawned on us that we are, in fact, really going to be leaving the country, with no timeline as to when we will ever be back. So, Brenda, Bailey and I plan to do all the things that we love about our city before we leave. It was a school day so Bailey couldn’t join us. It was a Monday, Brenda and I took the J train from Manhattan to Brooklyn. It runs on the same track as the Z train that also goes through Brooklyn. These are the subway lines that a certain famous rapper got his pseudonym from. In our case, it was the J train to Williamsburg. This, however, is not the Williamsburg of trend. Yes, there are the beards, but they belong to the Hasidic Jewish community rather than the ubiquitous hipster. There is a grit about the neighborhood still. Almost a blue collar feel as you walk under the elevated train tracks. Let’s just say, that it’s not prime real estate, but worth walking through it to get to our destination. We were on our way to Peter Luger Steakhouse. Peter Luger is that kind of place, where when you step in, you feel as if you are transported back to a bygone era. You know the time; when women loved their men for being men, men had a drink during the day, and women were treated like ladies. A place where the waitstaff are all men in their aprons, and the host upon greeting you, shows you to your table in a way that he makes you feel like you belong to an exclusive club. This place is like a long lost cousin you only see once in a while, either because he or she is always booked or hard to reach. When you do get together, it’s nothing short of a perfect time. The decor is somewhat Bavarian, with wooden beamed ceilings, large engraved beer steins displayed throughout and chandeliers for lighting. Cash is king. No need to bring your credit cards but do bring your personality, because there are some strong characters that work the place. Definitely bring your appetite, because the portions are not dainty. Lastly, only go with people you like because there’s no television or music to distract you. This place is for eating good meat, drinking good drink and having good conversation; all this and excellent service to boot. We brought our friend Mikey along, he’s our best friend, has served as our buffer for years and always great to have around for eating, drinking and talking. Upon being shown to the room by the host, as to where we were to be seated, the waiter, probably in his mid 30’s, hair slicked back, greeted us with formality and brought a basket of bread with butter along with 3 glasses of water to our table, and left the very simple menu for us to review. There was a bustle, almost a dance that the wait staff was doing. He stepped away to attend to other things and got back to us to take our order in an appropriate amount of time. It was yet another cold day and there was soiled snow everywhere outside, but inside it was warm and packed with patrons. There was a bustle, almost a dance that the wait staff was doing. It was clockwork the way they worked the crowd. It was also a very easy place to get your appetite up, as the aroma of wonderful sizzling beef waft through the air as the tables were being served. 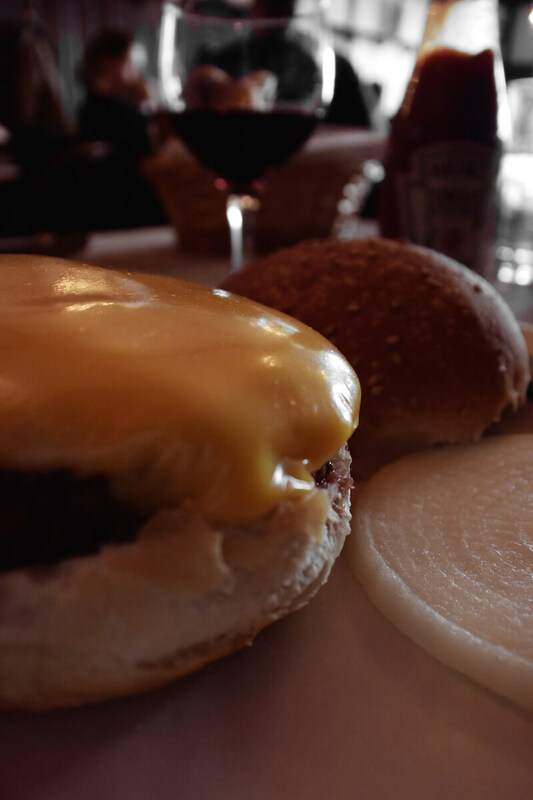 Burgers are only served for lunch at Luger. Though Luger is famous for its steaks, we all opted for the burger. We were there for lunch and wanted to take advantage of the opportunity to get the famous burger as it is only served at lunchtime. Also, what can be more American than the burger? It may be the one single meal that I will miss most during our upcoming journey to South East Asia. Chopped Steak at Peter Luger. A Monday special. Their burger is a practice in simplicity. Made of great beef with just enough fat content and seasoning. The mold is on the loose side, so it’s softer to the bite as opposed to the ones that are patted down heavy, and supposedly perfect at any temperature, but we all prefer medium rare. The bun is soft and sweet, and the only accouterment is a slice of raw sweet onion. There is an option of cheese and bacon for the topping. Mikey and I had it with cheese and Brenda, ordered the chopped steak version, in which the patty is served sans bun and plated with sauteed onions and creamy, buttery mashed potatoes.
. The sauce is unlike other steak sauces, it is a fine balance of horseradish and sweetness and the consistency a little looser rather than the thicker smokier saltier versions. Second, came the onion rings, which were more like onion strings. They were fried perfectly and every bit crispy with no trace of sogginess. There was definitely no kissing after this meal. Lastly, because we were brought back into an era long past, Mikey and I had a drink with our lunch. He a beer (lager) and me a red wine (cabernet). Brenda decided to just have a couple of sips from my glass. As for the meal, it’s almost not worth trying to articulate. Suffice it to say, that it was as good as good gets. We finished it off with their famous ice cream sundae, served with the most delectable whipped cream, vanilla ice cream, fudge, caramel, and walnuts. They never asked if anyone had a nut allergy, which we don’t, but what I’m getting at, is that Peter Luger just isn’t that kind of place that would ask. They’re unapologetic to the point of greatness. They simply serve their food the way they want to. No manipulation of the menu here other than the temperature of your meat. They’ve been doing it for 125 years, well before the rise, of the now ubiquitous, peanut allergy. There is something to be said about that and we love it. The waiter, gave us just enough space and time throughout the service, but in the end when we were finishing our dessert and coffee, he joined us in some simple conversation about the joys of days off, eating, relaxing and just watching time go by. Funny thing to say for a place where time stopped. With bellies filled, we took the J train across the Williamsburg Bridge back to Manhattan. As I looked around, I saw kids wearing Yankee baseball caps like their hometown hero, the rapper known as Jay-Z, and I also started to realize that it may have been the last time in a long time that I will be dining at Peter Luger. More importantly, that time does not stop and keeps moving on. It’s nearing dusk. But before then, we’re going to enjoy our City to the fullest. J, M, Z Train over the Williamsburg Bridge to Marcy Avenue (First stop over the bridge). 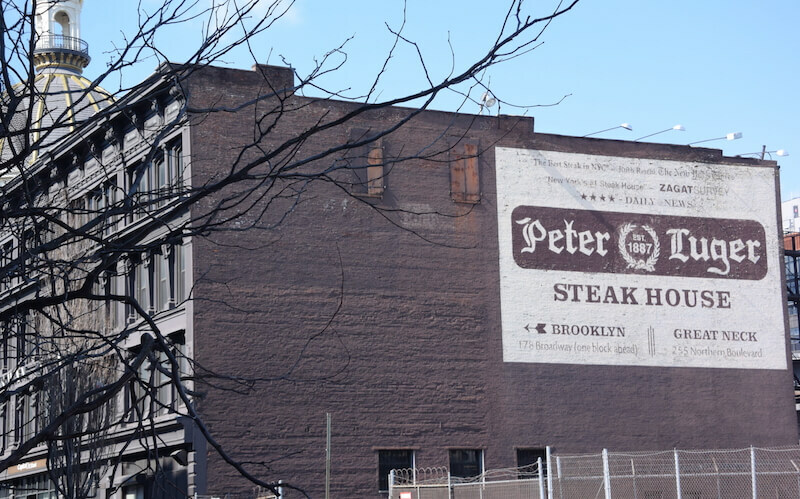 Walk on Broadway towards the East River to Peter Luger at 178 Broadway. If you liked this story, please share it with your friends, we’d be so grateful. Let’s travel the world, one dish at a time. Since I’ve never taken kids to New York City (yes, can you believe that! ), and I haven’t been to Brooklyn myself, I’m definitely pinning this post to my New York City board. I’ll have to look for more of your NYC posts, since I do hope that I’ll get to take the family there some time within the next two years or so. Not before too long. What a well written post! It really makes me look forward to reading your narrative of the trip around the world. Good luck, and keep writing! Jolanta: There’s a few NYC posts in our website, so give it a look. If you need further recommendations, feel free to reach out to us. love love love your words. transports one immediately to the time and the place. peter luger sounds like an exquisite experience. A classic rite of passage. A memorable evening here in the late 70’s still has the timelessness factor. Excellent write-up! Hands down one of the best places in the country for a steak- better bring your eating pants though lol. Looks like we’ll need to visit Peter Luger’s next time we’re in NYC. I love that classic restaurant no-nonsense staff kinda place. Sounds like the food was classic as well. I should never read food blogs at dinner time. Looks good. This is a great reminder, too, to write about what’s in your own backyard. I’ve been meaning to do more about Toronto. Thanks for the motivation. It’s always so great to enjoy the things in your own hometown; they often get over looked. Enjoy every second! You made me hungry and a little jealous. Yum! I love burgers and the ones you had look very nice. I will keep in mind of this place, for when i come to NY. That looks so good. When we were in NYC we wandered around looking for a place like this to eat but couldn’t find one since we were short on time. Definitely checking this place out next time we’re there! Looks like a real winner of a meat place! My husband would love to go there. He always chooses a steakhouse for dining out. Thanks for the tip! I’m sold on visiting Peter Luger next time I am in New York. Looks like a great place to visit.